Micah Parsons didn’t start a single game last season and still led Penn State in tackles, quite a remarkable feat at the school known as Linebacker U. Predicting success was easy for Parsons, the No. 1 linebacker recruit in the nation coming out of high school in Harrisburg. But even though he was playing well, the PSU coaches remained as cautious as they could with his development, so as to not overload him. “It was definitely more of a benefit,” Parsons said of not starting. “It made me stay hungry. … When you stay humble and you just keep working, you get better. Parsons didn’t mince words when discussing the dreams he has for the Nittany Lions. “In the next two years, you’re going to definitely see us in the national playoffs, if not this year,” he said on a conference call Tuesday. Parsons was named a Freshman All-American by numerous publications last season after pacing PSU with 83 tackles (48 solo). He had 1.5 sacks, five tackles for loss, five QB hurries and forced two fumbles. “I went through a lot of trials and tribulations early, trying to fit into the system,” Parsons said. Whatever those trials and tribulations might have been, they weren’t really noticeable to onlookers as the season progressed. Parsons has so much potential, expects so much of himself and is such a fierce competitor that it’s no surprise to hear him talk about how much better he can be this season and going forward. “I plan to show people how much faster I got, how our defense is looking faster than it’s ever been before,” Parsons said. His biggest area of individual improvement, Parsons noted, has been his footwork, which he believes will help his goal of finishing more plays. Parsons credits former PSU linebacker Manny Bowen as someone he looked up to and who really helped his development once he arrived on campus. Jarvis Miller, who like Bowen has transferred out of the program, also helped in that regard. The biggest influence on Parsons, though, has been defensive coordinator and linebackers coach Brent Pry. “He’s like a father to me,” Parsons said. “I don’t know where I’d be without Coach Pry. Pry has spoken extremely highly of Parsons at every turn, and for good reason given the young man’s potential. The two also share a common goal of striving for perfection. 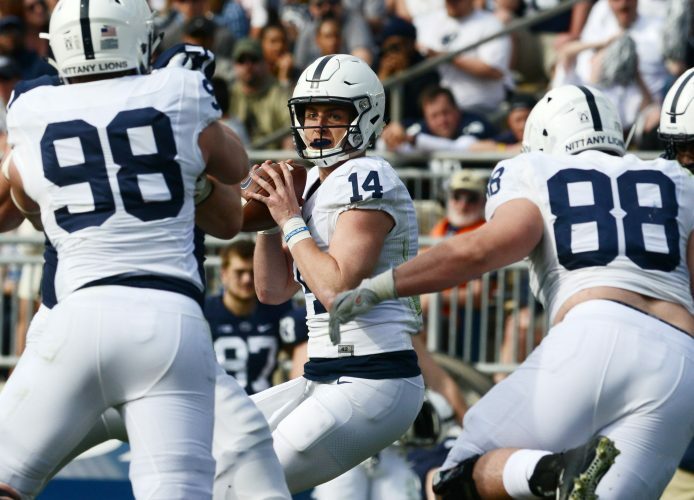 Parsons has a chance to be a superstar, both at Penn State and someday in the NFL. But while he’s in college, he wants to achieve as much team success as possible, and he’s doing whatever he can on and off the field to help make it happen. Parsons has become one of the best recruiters on the team, trying to sell his and PSU’s vision to other young players.